4oz. bottle designed for use in motorcycles, ATVs, side-by-sides, jet skis, etc. 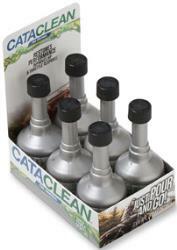 NOTE: Cataclean has been tested and is proven to be for use in 2-stroke engines. For proper use, follow instructions on bottle regarding mixture amount with gasoline. Cataclean must be mixed thoroughly with Gas BEFORE application of 2-stroke engine oil to fuel. Failure to mix Cataclean with gas prior to inclusion of 2-stroke engine oil may result in damage to engine.